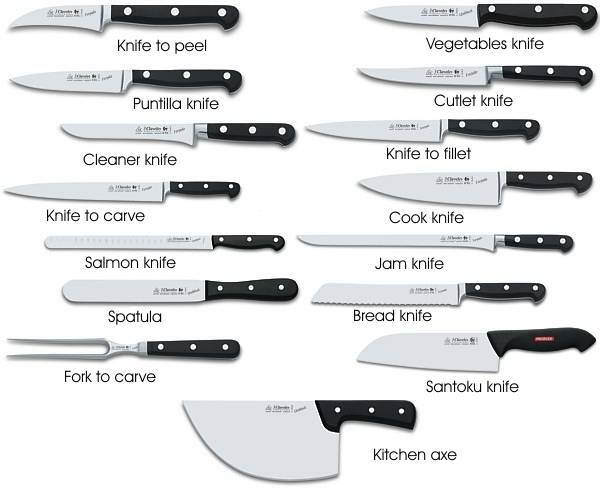 What are Different Types of Kitchen Knives? Contrary to what some of us may believe, kitchen knives are not divided into two basic types - sharp or dull. In reality, kitchen knives are to the kitchen what handsaws are to a woodworking shop. There are numerous types of kitchen knives, each with their own purpose and design. In the same way you wouldn't use a chainsaw to trim a picture frame, you wouldn't use a meat cleaver to peel potatoes, for instance. Each blade performs a specific task, so knowing the different types of kitchen knives can help a cook work more efficiently and safely. One of the most common kitchen knives used today is called a chef's knife. A chef's knife is used for many of the most basic food preparations tasks in the kitchen. It can chop through most vegetables and fruits, slice through meats and cheeses, and create a fairly fine mince or dice. Chef's knives are usually sold in different sizes, although the largest and smallest sizes still perform the same tasks well. The different sizes are used to match the size of the knife with the size of the user's hand. Larger chef's knives can be harder to control if you have smaller hands, so be sure to test the grip of any knife for comfort before you add it to your collection. Another variety of kitchen knife is the carving knife. A carving knife is generally larger than a chef's knife, although their basic shapes can be similar. A carving knife can be very rigid or very flexible, depending on the type of meat it is designed to carve. Carving a large pot roast may require a very rigid blade, while carving pork or fish steaks may require more flexibility. A carving knife is often accompanied by a large two-pronged tool called a carving fork. On the smaller end of the kitchen knives spectrum is the paring knife. A paring knife's blade is rarely more than four inches long (about 10 cm), making it ideal for peeling and coring fruits and vegetables. A paring knife is also used to create special garnishes and other decorative elements. A paring knife's blade should be kept very sharp to prevent accidents. A dull paring knife can cause the user to place too much pressure on the blade, leading to slips and cuts. Some kitchen knives are designed to prevent food preparation disasters. Many people find slicing through a loaf of bread to be an exercise in futility. This is why many cooks keep a long serrated knife on hand. A serrated knife works much like a crosscut saw in woodworking. Instead of slicing through the hard crust and soft interior of a bread loaf, a serrated knife's blade makes a series of short saw cuts instead. Without the serrations, a regular knife blade would slide smoothly across the top of the crust without penetrating it. Some fibrous vegetables and fruits also benefit from a serrated knife's crosscutting design. For removing bones from meats, many cooks uses narrow-bladed kitchen knives called boning knives. A boning knife is usually larger than a paring knife, with a rigid blade that tapers off to a point. It is used to carve out any remaining bones in red meats or to completely debone a whole chicken. A boning knife's narrow blade allows the user to cut around bones without excessive waste. A cousin to the boning knife, called a filet knife, is much more flexible and allows the user to remove skin from fish. One of the largest kitchen knives is the cleaver. A cleaver has a very heavy, thick blade for cutting through the thickest portions of meat or bones. Despite its imposing size, however, it can also be used for fine chopping and dicing. Cooks can also use the flat side of a cleaver to crush garlic cloves, whole spices or seeds. A cleaver's flat blade can also be used to transfer chopped ingredients to the cooking area. Other kitchen knives are more specialized, but they all serve a purpose. An oyster knife can penetrate the hard shell of oysters and clams and slice through the tendons holding the sections together. A deveining knife has a small, thin blade designed to remove the gritty vein found in raw shrimp, while simultaneously slicing through the shell. Other specialty knives help process grapefruits, slice through hard cheeses, open clam shells, and even carve steam holes for chestnuts. Melamine is an organic compound that is often combined with formaldehyde to produce melamine resin, a synthetic polymer which is fire resistant and heat tolerant. Melamine resin is a very versatile material with a highly stable structure. Uses for melamine include whiteboards, floor tiles, kitchenware, fire retardant fabrics, and commercial filters. Melamine can be easily molded while warm, but will set into a fixed form. This property makes it ideally suited to certain industrial applications. Melamine resin is manufactured by mixing urea with formaldehyde under heat and pressure. The substances begin to polymerize and are forced into a mold which will create the desired shape. Under pressure, melamine releases water, which could make the plastic unstable if it is not removed. The materials finish polymerizing and create a finished product, melamine resin. Melamine resin is known as a thermoset plastic, because the plastic is fixed after molding. If exposed to enough heat, melamine will melt. For this reason, melamine dishware should not be exposed to high temperatures like those in the oven and microwave. However, the plastic is able to withstand higher temperatures than other plastics. Because it is a thermoset plastic, melamine resin is difficult to recycle. Melamine can be made into a foam product. Melamine foam has a distinctive structure composed of stacked bubble shapes, which are extremely hard and therefore can easily clean a wide variety of substances. Melamine foam is marketed under a variety of commercial names including Magic Eraser, a cleaning tool well known for removing scuffs and dirt from a wide range of surfaces. 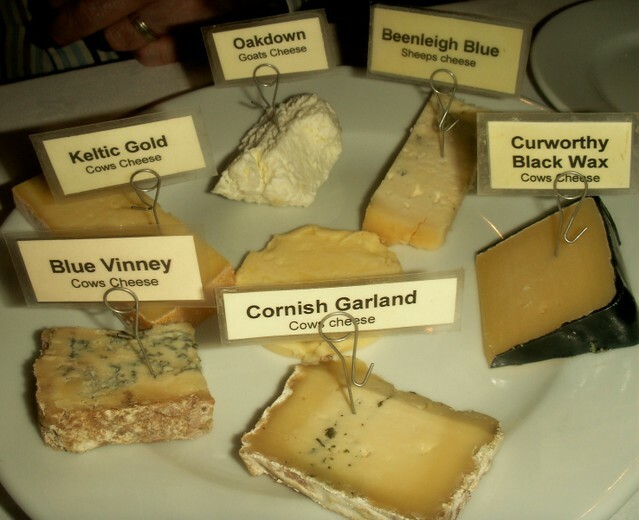 If you are planning to put together a beautiful cheese plate, check out The Cheese Board Collective in Berkeley. Their selection of local and international cheeses cannot be beat, and their prices are by far the best I have found. The Cheese Board has been in business for almost 39 years. They are a collective with about 30 members. Everyone who works there is a member and has equal decision-making power. They are so friendly and knowledgeable and….they have an amazing selection of international and domestic cheeses, as well as a bakery that produces interesting and delicious breads. I find that their prices are substantially less on their cheeses and breads than I find at high-end grocery stores or specialty shops. I love the casual atmosphere, too - the place is really charming. Bunn has been synonymous with great coffee for decades. Ever since their introduction in 1963, Bunn coffee machines have set the standard for commercial pour-voer coffee systems. Bunn has been an innovator in the coffee industry since 1957 when they started making a revolutionary paper filter. They were already well-known in the coffee and restaurant industry when they introduced the Bunn Model X, the very first Bunn coffee machine. In 1973, Bunn made coffee history again with the first drip coffee maker for home use. Their home drip coffee maker started a revolution in the industry and for the past forty years, drip coffee makers have held the largest market share of all types of coffee makers in home use. Bunn didn’t stop innovating with the drip and pour-over coffee makers, though. In 1990, they patented the first brewer to grinder interface so that Bunn coffee machines could grind and brew consistently great coffee every time. In 1997, Bunn took a stand against burned coffee with their Soft Heat system to keep coffee warm on the burner without overheating it. In 2001, Bunn introduced yet another innovation - the BrewWise system that saves individual customer profiles so that everyone in the house can have their coffee to their taste - or you can brew coffee just the way you like it for breakfast all the way to dessert coffee. With all that history of innovation and coffee goodness, you’d guess that the makers of Bunn coffee machines have some good advice for brewing coffee - and you’d be right. Here are some great tips for making excellent coffee from the makers of Bunn coffee machines. Start with great tasting water. Believe it or not, hard water makes the best tasting coffee. Soft water doesn’t extract coffee flavor from the beans as well as harder water - but hard water can be rough on your coffee machine. You can use a water filter to remove most of the impurities from water, or use spring water. Skip the distilled water, though. It makes coffee that tastes flat. Measure the coffee. Most of us here in the U.S. are accustomed to drinking weak brew made with too little coffee. Bunn recommends that you measure a full tablespoon for every five ounces of water. You’ll probably be shocked at how much coffee that actually is the first time you measure that out into your coffee basket, but the taste will convince you that this is what coffee is meant to taste like. Keep it clean to make it great. Coffee oils build up on glass and metal and can get rancid quickly. Clean equipment makes the best coffee because there are no old coffee oils hanging around to spoil the flavor. Clean the glass decanter after every pot. Toss out the filter and grounds the moment the brewing is finished to keep it from dripping into the pot. Clean the machine routinely following manufacturers instructions to remove coffee oils, lime scale and mineral deposits. Use the right size disposable coffee filters. If your coffee filters are too small, grounds may escape into the coffee. If they’re too large, water will wick up above the filter basket rather than dripping over the coffee as it should. Bunn makes paper filters that are perfectly sized to fit all of their Bunn coffee machines. Serve fresh-brewed coffee immediately. If you wait longer than twenty minutes to drink brewed coffee, it will begin to lose its flavor. If you won’t be drinking it that soon, you can hold it in a thermal carafe for up to sixty minutes before it starts to lose its flavor. Diet plans are essential for leading a fit and healthy life. There are various diet plans that you can select, based on your requirements. Some diet plans created are restrictive of carbohydrates and proteins. Others provide alternative food like cookie or the soup recipes. Still, others are integrated with stages or phases. But there's one which makes them united, most of them include fruits and vegetables. Description: Eat everything with perfect timing which was conceptualized by Jorge Cruise. It requires eating breakfast within 60 minutes upon getting up in the morning. Second is eating in 3 hour intervals or between meals. No more food is allowed 3 hours before going to bed at night. Downside: It is unhealthy since it doesn't practice good nutrition. In addition to that is the tendency for people to gain so much weight when diet stops. It increases risk of cancer. Description: It is a 7 day diet plan which includes cabbage soup recipe and other meals. Proper distribution of food groups within the 7 day period. It includes the special menu of cabbage soup. It also recommends taking in multivitamins to fight stress. It focuses on the lose water diet scheme. Advantage: It is effective for fast dieting. There is no possibility of serious heart problems. It includes a very simple recipe. Downside: Weight gain when one stops the cabbage soup diet. Description: It requires eating cookies the entire day to replace the breakfast and lunch meals. Dinner should be healthy and sensible. Using cookies in a low calorie diet tends to make someone feel full. Cookie is made of amino acids and fiber. Advantage: It is effective for those who skip meals and have no time. It does not need preparation. Downside: It is not easy to make it as a lifestyle diet scheme so it's short term. There are limited flavors for the cookies available. Description: It requires eating low calorie nutritious meals conceptualized by Dr. Joel Fuhrman. Primarily, focus on vegetables and fruits with less salt and sugar. Advantage: It aims to lose weight yet remain healthy. It is not a tasteless diet. It is lifestyle changing and good to lower cholesterol. Downside: It is lifestyle changing so it would require avoiding the usual snacking and eating out practices. Description: It requires eating a low calorie nutritious diet which includes raw food. It is also known as the living diet. Raw food is one of the best diet foods. It encompasses the living food philosophy. Advantage: It is a low calorie diet but healthy and nutritious. Some recipes do not require 100% raw food. Downside: Reality is that some vegetables can't be eaten raw. It entails planning and preparation. What to Eat: whole grains, almonds, bell peppers, tomatoes, broccoli, grapes, spinach, blueberries, strawberries, and olive oil. Advantage: There is wide variety of food prepared with flavor and easy to maintain. Recipes are prepared to be shared with all family members. Downside: It requires spending time for cooking. Description: The diet plans is restricted to low carbohydrates plus fruits and vegetables. It has 3 phases: restrictive, targeted and maintenance. It was created by Arthur Agatston. Advantage: One eats three meals a day with snacks. It's easy to prepare food which includes frozen entrees. Downside: Probably it is not as healthy as the Sonoma diet. Description: The diet plan involves a low calorie high in nutrients recipes. It must have a plan based on one's size from the Zone Food Blocks. It is a calorie restrictive diet. Advantage: It is a healthy and balanced diet of proteins, carbohydrates and fat. Downside: It needs menu planning to check on alternatives for meat. Description: It is a diet plan of eating 40% carbohydrates, 30% fat, and 30% protein. It allows one to enjoy 3 meals and two snacks each day. It is one of the most famous diets in Hollywood. It was created by Barry Sears. Advantage: It includes all types of foods. If you find yourself cooking for friends, being asked to cook a special dish for a family gathering, cooking in your spare time just for the fun of it, or heading for the cookbook aisle of the local library or book store, then cooking school may be your cup of tea. Take the initiative and get started on the road to becoming a chef. Even if you do love to cook, this doesn't mean it will be easy studying to be a chef. Like any career, it takes stamina, perseverance, and dedication to the culinary arts. The first thing to do is research the different cooking schools available to you. Cooking schools teach all the different aspects of cooking from main courses to pastries and desserts. Certifications or Bachelor Degrees are given on completion of the cooking program. Culinary Institute of America offers certification to those who demonstrate expertise and proficiency in their cooking skills. Bachelor Degree Programs are offered from Johnson and Wales University, Stratford University, and Baltimore International College. These are just a few of the many noted cooking schools. Be proactive in your search for the cooking school that fits your needs. Once you have decided upon the cooking school that is right for you, prepare yourself mentally. Even though you enjoy cooking for yourself and others, cooking school takes a lot of intense study and long days. The responsibilities of being a chef can be daunting. Every time a chef prepares a meal, pastry, or entrée, he or she is being judged by the people dining, so the cooking school instructors will be even harsher with you. A chef needs to be thick skinned, accepting the negative comments from diners, as well as the praise. It is difficult at times, to remain calm, trying to prepare the perfect dinner. The cooking school will try to prepare you for these types of confrontations; especially, if cooking for a well known restaurant in the future. Diners expect perfection. While attending cooking school, try to find a job in a bakery or small restaurant. This will give you experience being around a dining atmosphere, and you will become familiar with the responsibilities involved in being a chef. Even working as a waiter or waitress keeps you up with meal preparation, serving, and the current trends in food preparation. Experience with the people dining is as important as learning to cook. Check the reactions of patrons to the way meals are served, cooked, and presented on the plate. There is a wealth of knowledge to gain from working first hand at some type of food service while attending cooking school. 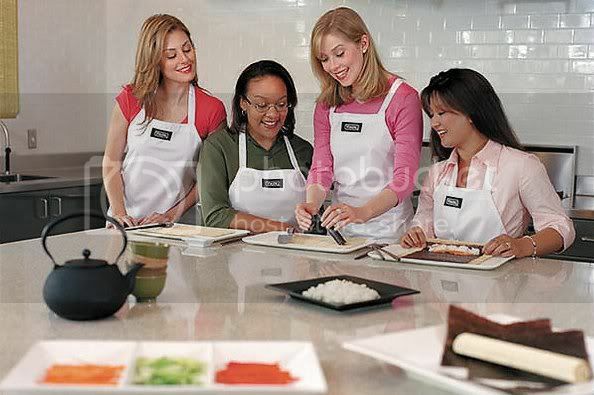 As you attend cooking school, you will develop confidence in your cooking skills. The sense of accomplishment as you meet the challenges of meal preparation will make all the hard work worthwhile. Being a chef is a never ending quest for knowledge, new cooking techniques, people skills, and bold, creative ways of preparing foods. If you decide cooking school is for you, take your passion for cooking to the next level. Before yogurt makers camealong, making homemade yogurt was practically impossible. The conditions have to be just about perfect for the yogurt to be successful. New yogurt makers have changed all this. You can make delicious, healthy yogurt in all types of flavors. The yogurt maker keeps the yogurt at a perfect temperature for all the live yogurt cultures to thrive in. The homemade yogurt is made from whichever type of milk you use: whole milk, 2%, or fat-free. The final yogurt ends up costing half of what you would pay in a grocery store, and it will stay fresh in the refrigerator for up to three weeks. Yogurt makers all come with their own instructions and recipes, but the basically yogurt making is all about boiling the milk, how to increase the temperature to reach the boiling point, or raising the temperature to incubate the yogurt. Boiling the milk destroys any bacteria, but does not affect the cultures in the yogurt. Pasteurized milk has actually already gone through this process, so it is only an added precaution. Follow the instructions with your yogurt maker for the amounts of milk, and the time to process it. Don't leave the yogurt in the machine after it is done, or it will curd and separate. It is best to refrigerate it as soon as possible to keep it fresh longer. Using skim milk or powdered milk will give the yogurt a soft consistency. If you would like the yogurt a little thicker, add about ½ cup of powdered milk to it before heating. Check the expiration dates on the plain yogurt you buy at the store for live cultures. The longer the yogurt stays on the store shelf, the weaker the cultures will be. Also, make sure you use plain yogurt for the cultures. You can add fruit and flavoring later. The longer you cook the yogurt, the sourer it will be. If the milk is cooked for too long at a high temperature, the yogurt will not be as good, but you want to make sure all bacteria is killed. There is a fine line here that takes some practice. Once you get the hang of the correct time and temperature for the yogurt, all your yogurt will be delicious. Practice makes perfect. Use only clean kitchen tools to prevent bacteria growth. Cool the milk to the temperature recommended by your yogurt maker, and then add the yogurt starter. If it is too hot, the cultures will die. It is similar to adding yeast to bread. The temperature is very important for growth. Keep the yogurt maker away from drafts or cool areas that could lower the temperature of the maker. This is also similar to rising bread. Don't be tempted to open the yogurt maker during the process. After following the yogurt maker's instructions for processing time, remove the yogurt and refrigerate. Make sure the yogurt is cooled before adding flavoring and fruits. Be creative with your flavorings, using all your favorites. That is the great thing about making your own yogurt. You can add whatever your favorites are to the yogurt for a really yummy, healthy treat.